I delight in creating mixed-media art layered with maps! I use maps as a medium in my art because I am captivated by the way they look – their lines, rhythm, movement and patterns. I find inspiration in vintage atlases I collect, fascinated by the antiquated pages and the ideas of time and travel they contain. Maps and cartographic elements are repeating motifs in my work because I love both the concept and imagery of maps. Mary C. Nasser earned her Master of Fine Arts in Studio Art: Painting from Michigan State University. 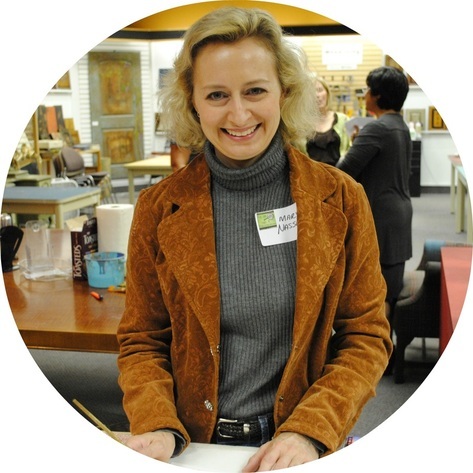 During her graduate studies, Mary also studied Medieval Art History abroad in London, England, and attended a monotype workshop in Mexico City. In 1996 she was a visiting artist and guest lecturer in Cluj-Napoca, Romania, where she lectured at Academia de Arte Vizuale “IOAN ANDREESCU” (Academy of Visual Arts) and exhibited her work in "Deschideti U.S.A." (Open the Door) at the Casa Matei. Mary has had over 30 solo shows since 2002 and has been awarded numerous residency opportunities. Since 2007, she has participated in three public art projects in St. Louis, too. Recently, Mary's mixed-media map paintings and interview appeared in Featuring magazine. She is also a contributing artist in the book Stencil Girl by Mary Beth Shaw and Making Art From Maps: Inspiration, Techniques, and an International Gallery of Artists by Jill K. Berry. She is on the StencilGirl Creative Team and designs stencils for StencilGirl Products, too. She’s also designed a line of cartography-inspired rubber stamps for RubberMoon. Throughout the year, Mary leads Garden Art activities at St. Louis Children's Hospital and Healing Through the Arts workshops at Mercy Children’s Hospital and the David C. Pratt Cancer Center.